Introducing the newest addition for your street of 1/4 scale shops. This time, we have designed a darling toy shoppe. As with all of our 1/4 scale shop projects, this one has a hinged front which opens to reveal a darling interior. The building is lit with led lights, which are powered by a coin cell battery. The battery and on/off switch are cleverly hidden under the roof for easy access. This shop was a bit of a challenge, and we really had to get to know our 3D printers very well in order to complete it. The exterior has two darling toy soldiers standing guard. These highly detailed items are 3D printed. They will come to you unpainted, but the 3D material is very easy to paint and the design is quite simple. The interiori of the building features a full back wall shelving unit as well as a counter. Both of these are filled to overflowing with toys. The majority of the toys are 3D printed. In addition I have included lots of paper items including three little bliss dollhouses and two play theatres. 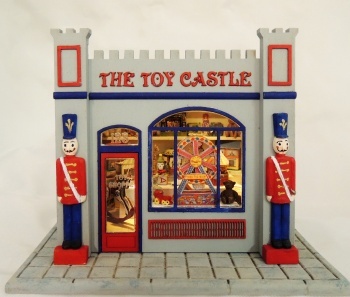 There are also a couple of items from antique toy paper models. And finally there are half a dozen metal cast toys. All of the 3D printed and metal cast toys do come to you unfinished, so you will want to have a nice assortment of acrylic paints and a nice fine brush to use to finish them. We have everything from a hot air baloon, bunny, lamb and bears to a fabulous castle. The side walls each have a shallow shelf full of boxed games. All of the game boxes feature authentic artwork from turn of the century games. 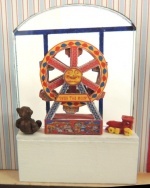 The front window holds a darling ferris wheel that I designed expecially for this project. While it does not move, it is quite detailed and the artwork is really fun. As with all of our 1/4 scale kits, everything you see in the photo is included in the kit. Students will need to supply basic tools and supplies such as Xacto knife, glue, scissors, paints, etc. The scheduled delivery for these kits is approx. May 26. We need to allow an adequate registration period and then have time to produce the kits for the registered students. All classes/kits are offered on a first come first served basis. Quanities are limited. If you have any questions, drop us an email!